Written by Janet Choi on July 7, 2016 . Based on these events, you can perform complex segmentation of users and send automated emails, triggered off of these in-app activities. What types of campaigns can I send? Up to 80% of people who perform new installs typically leave after the first month. Eek! 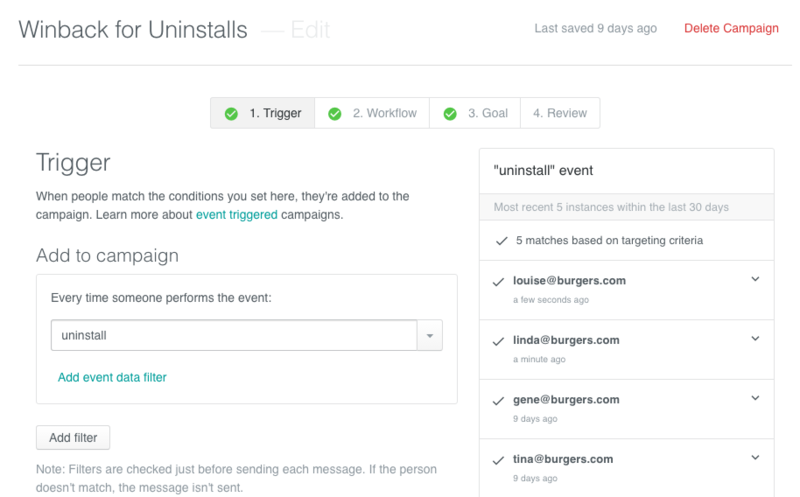 Now you can reach out to users who have recently uninstalled your app. Email people to learn why with a quick survey — or draw them back with promotional offers or by showing them what they’re missing out on. Send a personalized welcome for new app registration events, adding context to in-app tours and taking advantage of the content real-estate that email provides to inform new users about all the great things they can do in your app. Use open events (like opened app at least 5 times in the last week) or custom events like a product view to send abandoned cart emails or follow up with perfectly timed and personalized offers. Inactivity is just as powerful a signal of behavioral intent as activity. 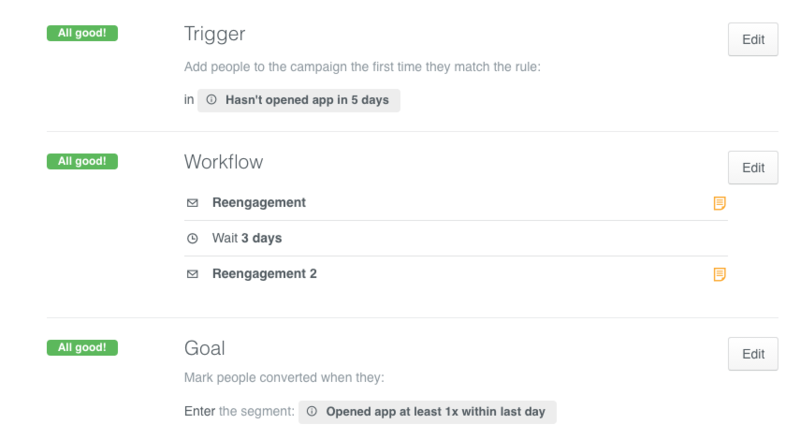 Create a segment of users who haven’t opened the app in 5 days, for example, to re-engage people and get them back into your app. Whether it’s announcing a new version of your app or sending out a promotional offer, base your message based on specific user behavior. For example, you could use different messaging in a newsletter to your power users versus your less engaged users. Whether it’s a receipt for purchase, booking confirmation, or password reset, you can use Customer.io to make sure your transactional emails add value to your user’s experience and provide important information for their records. Mobile apps don’t operate in isolation, just as your customer doesn’t operate in a vacuum. 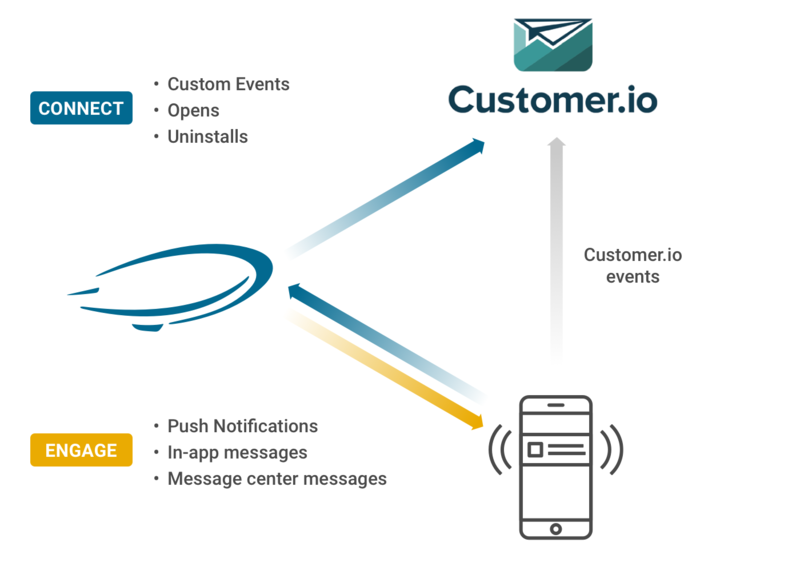 By adding email to the push notifications and messages sent through Urban Airship, you’ll create a great and consistent multi-channel engagement experience that reflects the multi-channel world your customer inhabits! Have questions about Urban Airship Connect and Customer.io? Shoot us a message at win@customer.io!